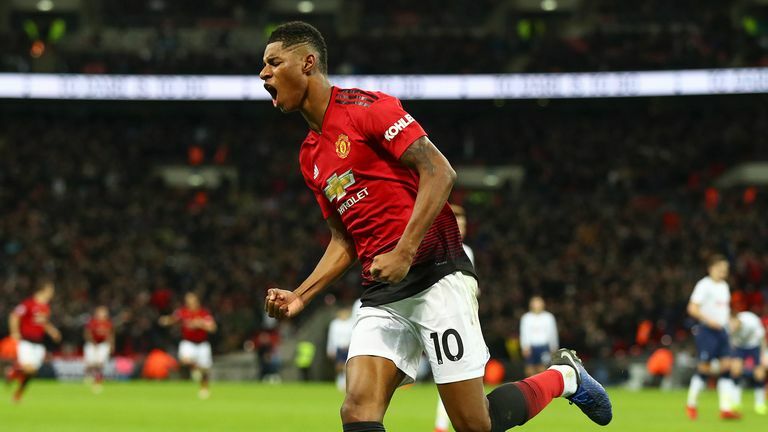 Marcus Rashford is set to make his 150th appearance for Manchester Utd when they face Brighton on Saturday and he reaches the landmark in the best form of his young career. Rashford's winning goal against Tottenham on Sunday was the 10th time he had either scored or assisted in the Premier League since the start of December. The glut of goal involvements was sparked by his two assists in United's 2-2 draw with Southampton. Since then, he has contributed one every 76 minutes across nine appearances, a far superior rate to his average in the previous year. The visit of Brighton could see Rashford start 10 successive Premier League games for the first time. His only previous run of nine successive league starts came right at the start of his senior career in February 2016, when he burst on to the scene under the management of Louis Van Gaal. The last five Premier League games have produced five Manchester Utd wins under the caretaker charge of Ole Gunnar Solskjaer - and Rashford has started each time as a striker, albeit slightly to the right in the most recent win over Tottenham. He never started more than two successive Premier League games as a striker under previous manager Jose Mourinho. The added responsibility seems to have brought out the best out of Rashford. He has now scored in three successive Premier League appearances for the first time in his career, becoming the third youngest player to achieve that feat for Manchester Utd in the Premier League era. Somewhat surprisingly, Rashford's shot conversion has only improved marginally under Solskjaer, a former striker noted for cool finishing during his own playing career. But Rashford is in a position where he is able to shoot far more frequently now - once every 20 minutes under his current manager compared to once every 47 minutes under Mourinho. Should his chance conversion show further improvement, he could become even more prolific. Rashford can reflect on a remarkable start to his career as he prepares for his 150th Manchester United appearance at the weekend and the third anniversary of his senior debut next month. Since his debut, he has made more appearances in all competitions than any other current Premier League player - playing in 149 of Manchester United's 169 games and making 11 more appearances than his next-highest outfield team-mate, Jesse Lingard (138). Rashford's total of 40 goals since his debut is also the highest for the club, more than Anthony Martial (37), Romelu Lukaku (36) or Paul Pogba (24) who arrived at Old Trafford for a combined sum of around £240m. Does Marcus Rashford make your team? Having only turned 21 last October, Rashford's stats also stack up favourably against those of his attacking team-mates for club and country at the same age. Only Lukaku had scored more club goals by Rashford's current age, with the majority of those coming in Belgium as a teenager. England captain Harry Kane had not even made his international debut by 21, whereas Rashford has 31 caps and has played at two major tournaments. With seven Premier League goals this season, Rashford only needs one more to make this his highest-scoring campaign in the top flight. But at his current trajectory, he could easily surpass double figures and make this the most memorable individual season of his career so far.